COUNCIL BLUFFS, IOWA (KMTV) -- For nearly 27 years, Trooper Scott Miller with Iowa State Patrol has kept Iowa roadways safe. “Our job takes place on the side of the road,” Miller said. “That's where most of our traffic stops are done in busy, busy traffic conditions." Conducting countless distracted driving stops. "I’ve seen it all,” Miller said. “Changing clothes, reading, putting on makeup, I've seen all types of crazy stuff." Giving troopers something else to keep an eye out for. “Not only are you worried about who you've stopped and who's in the car,” Miller said. “But the bigger concern and biggest worry for the troopers that are out there they know that the most dangerous part of their job is the motor traffic that's around them." Trooper Jon Stickney shares pictures of his patrol cars that have been hit on Iowa roadways this year. During Thanksgiving weekend, Iowa State Patrol assisted 213 motorists, covered 181 crashes, issued more than fifteen hundred speeding citations. 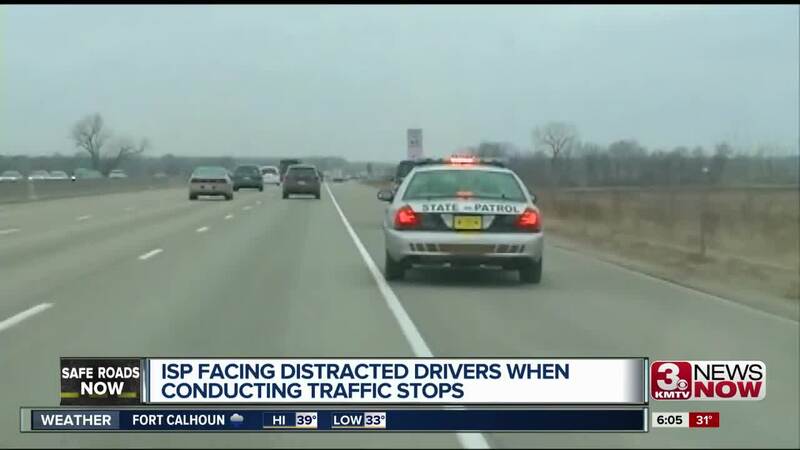 "If we could get the people, the drivers to put their phones down and not be distracted, we would eliminate most of these crashes,” Miller said. Although we live in a safer society than ever before, Miller said the number of distracted crash fatalities doesn’t reflect that. “We have cars that stop themselves,” Miller said. “We got air bags coming out of every possible place to keep that driver safe, so what is the problem? The only thing that's changed in the last five years is the phone. And the distractions." In Iowa it's illegal to text and drive but phones are still allowed. "They actually have to be manipulating the buttons, as far as making a text,” he said. “So being on GPS for example would not be illegal." Miller said that’s confusing to a lot of drivers. “It should just be all encompassing,” he said. “Let's put the phone down. Let's not be distracted. That's the bigger picture."